Do you find yourself in constant conflict over screen time in your home? Are you arguing and trying to set limits and controls? It could be because your kids have developed a screen habit as their go-to, almost unconscious activity. The new year is the perfect time to make needed screen adjustments for your children. Breaking bad screen habits seems like an impossible dream for many families, but little changes can bring big results in your home. A habit is made of three parts: a cue, a routine, and a reward. In order to reshape your child’s screen habit, you must change one of these parts. 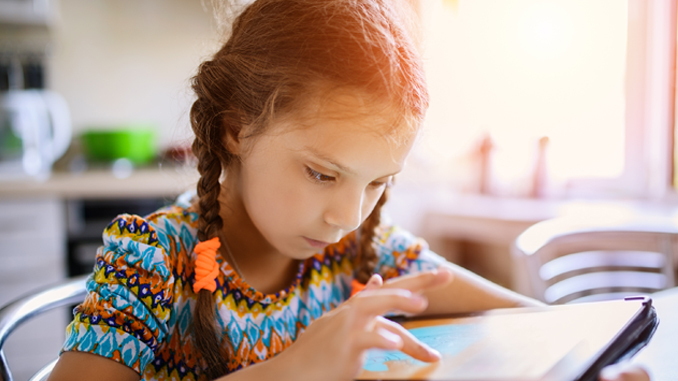 Try these steps to change your child’s screen habits. Track screen habits. Spend a week or 10 days keeping track of the time your children spend on a screen. Write down when they play, how long they play, what they are playing, who they are playing with, where they are playing (what part of the house), and the reason for play (bored, depressed, lonely, etc.). Interrupt the cue. If your child is in the habit of gaming right when he comes home from school, then change it up. Figure out a way for him to hang out with non-gaming friends or play a sport after school instead. Change the routine when he walks in the door. If your child games before bed every night, then do something as a family instead. Read aloud, play a round of cards, or do any activity that allows you to connect face-to-face before bedtime. Rethink the routine. Many kids adopt bad screen habits because parents leave the activity planning and picking to their children. Parents should structure healthy activities even for older teens if needed. Try cooking together, doing chores together, biking and camping as a family, or planning family fun nights out to ball games and the theater. The key is doing new things together. Change the reward. Don’t let screen time be the only reward you dole out at home. What do you value as a family? Whether it’s the latest Lego set or an outing to an escape game or laser tag, help your child earn points toward that instead of granting screen minutes or hours. Time with you can increase family attachment, a critical factor in combating screen addictions. Once the habit has been broken, use the following ideas to introduce a balanced approach to screen time. Keep screens out of sight and out of the bedroom. Stow away consoles and TV remotes to promote intentional use instead of the default activity. Place fun activities in clear view. Keep board games, puzzles, playing cards, magazines, newspapers, photo albums, and books out in the kitchen and family room. If they are put away, they will not be used as much. Be prepared with food. Have healthy snacks out and ready when you connect with your kids after school. Take this opportunity to put your screen away and listen to how his or her day went. Sharing food is a bonding routine; it stimulates conversation and can reset a potentially isolating time of day. Replace the old screen-time rewards with activities that include face-to-face time. The best rewards are physical activities or creative endeavors and more time spent with parents and siblings, not more screen isolation. Relax, smile, use humor and have fun together. When they look back at their childhood, your kids will hang on to the little things that make your family special, not memories of endless hours in front of a screen.